Looking for your next favorite contemporary romance series? Look no further than Lauren Layne’s The Wedding Belles: a contemporary and witty romance series about three high-powered New York City women who can plan any wedding—but their own. If that won’t convince you to get reading now, check out this review of the prequel to the series, FROM THIS DAY FORWARD, by one of our resident XOXperts Kathy A., plus a little something extra! 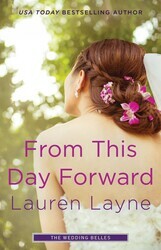 From This Day Forward is a steamy prequel to author Lauren Layne’s The Wedding Belles series. Now that I have had a taste I can’t wait to read the next book!! This novella is a short introduction to the ladies of the Wedding Belles, an elite New York wedding planning agency. Leah McHale is an up-and-coming wedding photographer offered the assignment that can launch her career. But there is one problem she must face – working with her ex Jason Rhodes. Jason broke Leah’s heart last year and she is just now trying to move on. They both agree to work together and Leah insists on being professional. Being professional is difficult with their reunion stirring up old feelings and sizzling chemistry. This is my first book from author Lauren Layne and I loved this! The ladies of the Wedding Belles are business partners and supportive friends. I can’t wait to learn more about them. Leah and Jason’s love story was quick but it was filled with emotion. In this quick story I got the full sense of who they were but I wanted more! I hope they are featured in more books in this series. I highly recommend From This Day Forward to fans of second chance romances. This is the perfect read to add some romance to your day. From This Day Forward is now available from Pocket Star! I have this book – but haven’t read it yet! I just finished “To Have and to Hold” and LOVED it so that means I must read this one! Thank you for sharing my review! I loved this novella and can’t wait to meet the other ladies of the Wedding Belles! I LOVE this series!! The Wedding Belles is one of my very favorite wedding series. Highly recommend! Great review Kathy! I am loving this series.